Complex presentations get plenty of press these days, but few walleye tactics are as deadly—or as easy to fish—as the simple slip-bobber rig. With a well-balanced float, you can efficiently and precisely suspend mouthwatering live bait in front of hungry ’eyes. Plus, you know exactly when a fish has inhaled your bait. Veteran guide Mike Christensen is a believer. Big time. 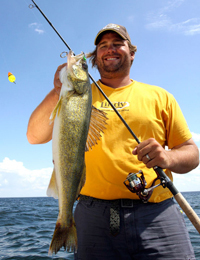 From his home base out of historic Hunter Winfield’s Resort on the scenic south shores of Minnesota’s mighty Mille Lacs Lake, the jovial yet dead-serious walleye hunter launches literally hundreds of missions onto the fabled fishery with one goal in mind: connect clients with the big lake’s walleye bounty. His success rate is epic, and one of his favorite presentations throughout much of the season is, you guessed it, a slip-float rig. When wind whips the surface, a Thill Pro Series Slip Float rules the waves. He favors the size XXL version, a 1-incher that’s easy to see bobbing amidst the whitecaps. But when the wind dies and surface flattens, he deploys a new secret weapon that livens up his bait in spite of the lull—Thill’s Wobble Bobber. Thanks to an aerodynamic profile and slick internal weighting system, the Wobble Bobber also grabs serious air when slung from standard spinning tackle. Such long-casting properties are perfect for keeping your distance when targeting nervous ’eyes roaming the shallows. Long casts also make it easy to thoroughly cover a reef or other structure from an anchored position—without moving the boat—and are a huge plus for the shore patrol. Christensen says the Wobble Bobber is lethal for skinny water walleyes that are patrolling weeds, shallow rockpiles and boulders, or holding on the edge of steep breaks. “I use it in deep water situations as well,” he adds. When it comes to the deep game, one of the classics is a pattern Christensen and fellow Mille Lacs guide Jon Thelen fondly call “road hunting.” At its core, the tactic involves cruising the tops and slow-tapering edges of promising reefs, mud flats, gravel bars and other promising areas at slow speeds, watching the sonar for signs of active fish hovering a foot or so off bottom. Christensen spools with 8-pound green monofilament mainline. After threading on an adjustable bobber stop, he slides on the Wobble Bobber and then ties a swivel to the business end, followed by a four-foot length of the same line. (Note: Christensen says that doubling the line makes it easier to thread through the Wobble Bobber.) A split shot large enough to balance the bobber is pinched on a foot or so beneath the swivel. “This reduces the chances of the rig tangling on the cast or the drop,” he notes. Another 24 to 30 inches below the shot, he adds a 1/32-ounce Lindy Jig. The leadhead sports a sturdy hook that’s large enough to hold a jumbo leech or half ‘crawler, yet is light enough to rise and fall seductively with the waves, or action imparted by the bobber. Jigs also offer a more lifelike profile than plain hooks, he adds. “Hooks hang vertical, but I want a horizontal profile, which mimics the natural look of swimming prey,” he explains. 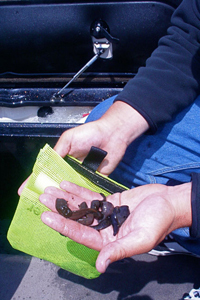 While leeches are Christensen’s go-to bait, nightcrawlers often get the nod during bug hatches. “Hook them through the nose and pinch the crawler off halfway down,” he says. Rigged and ready, Christensen idles over flat-topped feeding structures and gradually tapering edges along their sides. “Steep drops are tough to road hunt, because you have to change the depth of the jig,” he says. Whether it’s calm or windy, Christensen likes the Wobble Bobber for road hunting because of its ability to deploy 20 to 30 feet of line more quickly than many conventional floats. Lively, active Leeches catch the most fish. Keep them healthy in a Bait Tamer.